Senator Bongbong Marcos got the most value for money among vice presidential bets in the 2016 elections as he spent less than P10 per vote. Based on his statement of contributions and expenses submitted to the Commission on Elections, Marcos spent only an average P9.92 for each of the 14,155,344 votes (just a fraction short of the winner) he received. Marcos, who hails from the Ilocos region where residents have been typecast for their frugality, had the fourth biggest expense report with P140,539,366.34. Leni, who won with 14,418,817 votes had the highest campaign tab with P418,664,130.60. Despite landing second to last, Senator Antonio Trillanes IV had the most expensive votes among VP bets. Trillanes spent an average of P71.26 per vote or more than double the average cost. Trillanes had 866,801 votes and P61,896,067.33 in expenses. Senator Francis “Chiz” Escudero had the second most expensive campaign with P65.09 per vote with P321,014,827.64 in expenses (next only to Robredo chart-topping expenses) and 4,931,962 votes. Senator Alan Peter Cayetano spent P32.04 per vote on P189,129,872.48 expenses and 5,903,379 votes. Senator Gringo Honasan spent P33.28 per vote on P26,259,899.20 expenses (the least spent among VP bets) and 788,881 votes. 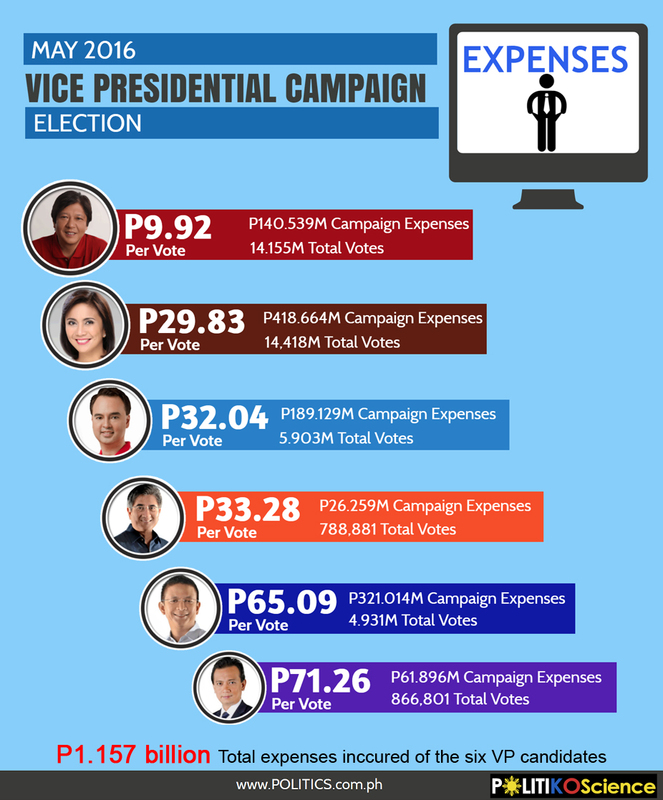 Overall, the six VP bets spent an average of P28.18 per vote from total expenses of P1.157 billion and total votes of 41,066,884.
Who had the most value for money among VP bets in 2016?